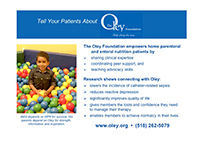 Help spread the word about the Oley Foundation during your next presentation to colleagues, consumers/patients, and others. Choose from the following slides and add to your powerpoint presentation. Click on the slide name (e.g. "Brittany, animated"), download to your computer and save the file—before opening. Contact Roslyn Dahl if you have questions or would like a customized slide (dahlr@amc.edu; 518-262-5079).